In the new Transformers movie, one of the endless impossible-to-follow chase scenes takes place in Washington DC. However, Illinois highway signs are clearly visible in the scene. You'd think with all the money spent on special effects, the filmmakers could show enough respect for the audience to at least digitally replace the signs. Does director Michael Bay assume we are so geographically illiterate that no one will really notice? What next, a Los Angeles chase scene with the Statue of Liberty in the background? Actually, we shouldn't be surprised. 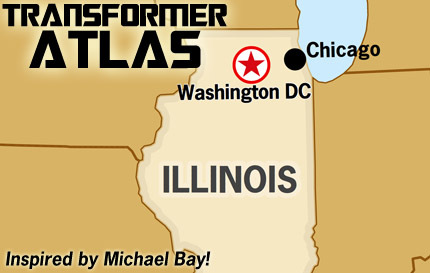 In the last Transformers movie, Michael Bay completely removed Israel from the map. (More on that tomorrow.) Much thanks to Duane Dudek, who pointed out Bay's geographic disrespect. Pawnee, Indiana is the setting for NBC's hit sitcom Parks and Recreation. We're taking a bit of a summer break here at Lost States, so we figured we'd take a road trip to Pawnee to check out the Harvest Festival. Sure, some of you spoilsports will try to comment that Pawnee is fictional... but watch our video above (from our most-popular post ever at the Lost States blog) and you might change your mind. 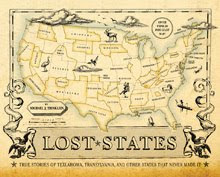 OK, so maybe we won't go to Pawnee... but we are taking a bit of a "stay-cation" here at Lost States. New posts will resume in early July. Thanks! 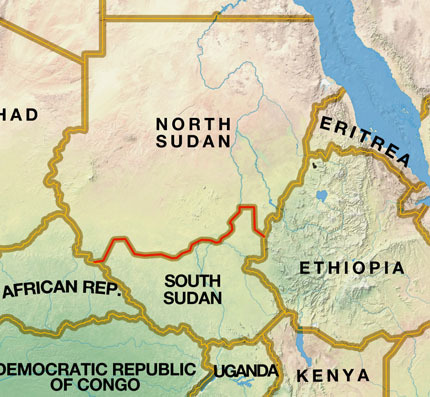 It's just a matter of days now until Sudan splits into two nations, and the divorce is looking ugly. The problem is that the south has the best oil fields, but the north has the pipeline that gets the oil to market. So they have to work out a deal. I'm not optimistic. Heck, the NFL can't even work out a deal. The two Sudans haven't even agreed on a border yet! That's like walking in to the lawyer's office to sign the final divorce papers... without having settled who gets the kids. This can't go well. Then again, Sarah Palin will visit on the day the split becomes official, so maybe she can negotiate the whole thing. Sure. (My map above shows the pipeline and oil fields) More from Reuters. Check out the remarkable thing President Obama said Tuesday about Puerto Rico. In his speech, he stated (regarding the island's future as a state or as an independent country), "When the people of Puerto Rico make a clear decision, my administration will stand by you." That might sound reasonable at first, but imagine Lincoln saying, "On the matter of whether to stay in the Union or leave, when the people of South Carolina make a clear decision, my administration will stand by you." 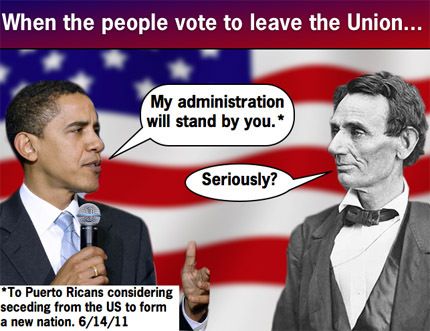 Uh, no... Lincoln would never have said that. In fact we fought a war because Lincoln wasn't so big on local governments determining their status on their own. Don't misunderstand—I'm not saying Obama is right or wrong. Heck, I'm not even saying Lincoln was right or wrong. My only point is that these guys are diametrically opposed on the notion of self-determination. Puerto Rico: more like Hawaii? Or Philippines? There are two ways to handle Puerto Rico. The Hawaiian way or the Philippines way. Both Hawaii and the Philippines (like Puerto Rico) are islands acquired by the US in the 1890s. All three have populations that are ethnically and culturally distinct from the mainland US. All three faced (or face) this question: statehood or independence? 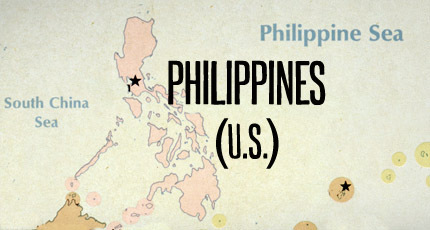 In the case of the Philippines, the US considered statehood, but opted to give the islands their independence. In the case of Hawaii, the US considered independence, but opted for statehood. But Puerto Rico is stuck in limbo. The U.S. is like the boyfriend who refuses to get married... and Puerto Rico is the girlfriend who deserves a commitment... or be set free. 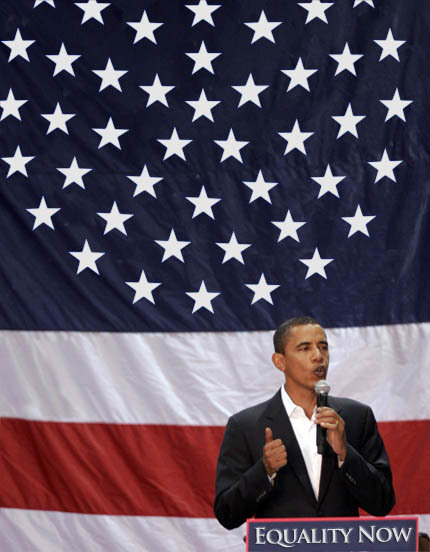 Which 51-star flag do you like? Which 51-star flag design do you think the USA should adopt when Puerto Rico becomes a state? Given the president's trip to Puerto Rico today, statehood should be a done deal. (Kidding!) Still, when we do get a new state, we'll have to redesign the flag. The three likely candidates are above. Which do you like? I kind of like the one on the right. Tomorrow, president Obama goes to Puerto Rico—putting statehood into the national news cycle for the first time in 50 years. Normally, this is seen as an issue favoring Democrats. That's because if Puerto Rico became the 51st state, two new Democrats would enter the US Senate—at least that's the conventional wisdom. But history tells a different story. When Alaska and Hawaii entered the union, everyone assumed Hawaii would elect two Republican senators, and Alaska two Democrats. No, that's not a typo. Back in 1959, Alaska wasn't Palin-friendly (Sarah hadn't been born yet, but you know what I mean)—it voted mostly Democratic. And Hawaii was considered safe for Republicans. How times have changed. The point here is that the state of Puerto Rico isn't necessarily going to vote Democratic. Many Latinos are conservative on social issues, and thus vote Republican. The current governor of the island, Luis Fortuño, is a Republican. One crafty GOP strategy would be to advocate statehood (and grab Latino votes nationwide) by evoking the Lincoln-esque notion that the US should not have any second-class citizens. The talking points would go like this: Puerto Ricans fight in American wars, but they cannot vote for the commander-in-chief. While Luis Fortuño could run for President of the United States, he cannot, by law, vote for himself. This is the kind of injustice Republicans fought and died for 150 years ago. Alas, today, they seem quite happy to ignore the plight of second-class citizens in Puerto Rico—and prefer to let Democrats take the high road on this issue. Regardless of which party carries the ball, the goal should be statehood OR independence. The middle ground—of second-class citizenship—isn't the American way. 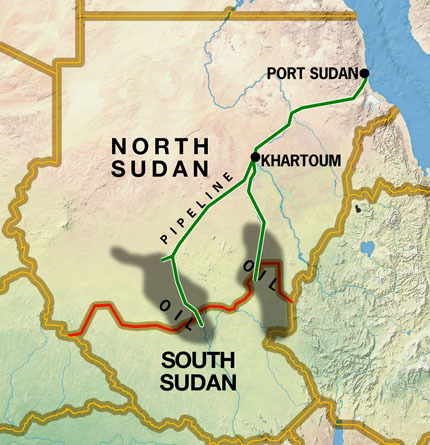 On July 9th, South Sudan becomes the world's newest nation. That same day, Sarah Palin plans to visit South Sudan. I can't decide if this is good, bad, or just weird. I can say that this has been under-reported in American media. First of all, the border remains something of a war zone, so I hope Sarah Palin is packing heat. Kidding aside, is it really wise for Palin to release information about her trip so far in advance? When the president or other high official goes to a war-torn country, it's all top secret until they are actually on the ground.... because (if it's not obvious) that gives bad guys less time to plan. I'm not saying Palin shouldn't go. Perhaps her presence will call attention to the atrocities in this ravaged country... or give encouragement to the (extremely) new government. But it seems like poor judgement to release this information so far ahead. (ABC News' Dana Hughes is one of the few reporters to stay on top of this story. ) More on South Sudan's nationhood in our previous post. In what state is a pedestrian most-likely to get hit by a car? Florida, by far. But when I read the full report on pedestrian danger, I noticed no map... and it needed one! That's because a trend becomes clear when you plot the data. 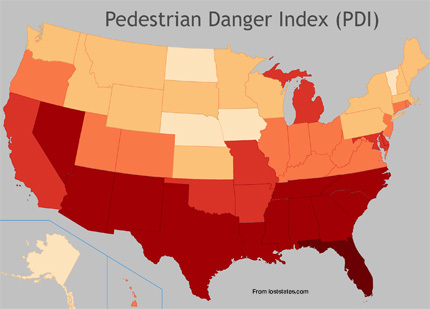 Specifically, the south is a bad place to be a pedestrian. Why that is, I don't know. And why is say, Alabama, worse than car-crazy California? Is it because there are more elderly drivers in the south? Or is it just the fact that nobody in the north walks in winter, so there's no pedestrians to hit in the tundra states for much of the year? What do you think?? This is actually an important issue. At least one group says that better design of our roads and walkways could have prevented 47,000 pedestrian deaths in the last 10 years. Bigger map HERE. There's no state named "Rhode Island"
It's true. There is no state named "Rhode Island." 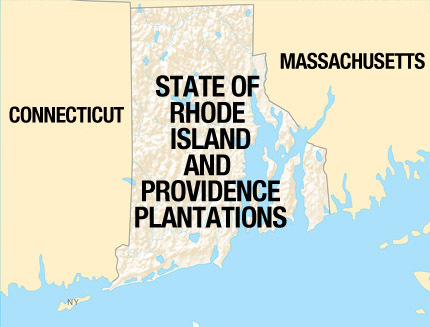 The actual name of the smallest state is "State of Rhode Island and Providence Plantations." "Rhode Island" is just a nickname. 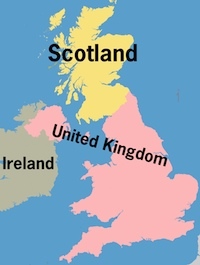 The state's official name is so long, it won't fit on any map... no even a map that's actual size. So the state usually goes by its nickname. Last year, voters cast ballots on whether to make the shorter name official. Some thought the word "plantations" had ugly connotations of slavery, others defended the state's history on this issue. The measure lost, and so the long name remains official So, please refer to the state by its official name. I mean, if we start shortening state names for convenience, think of the result. We'd have states named "Al" and "Ken" and "Ida" and "Minni" and "Cal" and "Tex." Wall Drug, in Wall, South Dakota, is among of the most interesting (and most kitschy) places in the west. It remains a "must-stop" for anyone heading west to Mount Rushmore. Originally, Wall Drug was just a tiny drug store... then they began offering "free ice-cold water." Well, lots of places would give travelers free water, but Wall Drug advertised that fact far and wide with a huge number of clever road signs. The result was an incredible boon--now Wall Drug is a monstrous Disney-esque attraction that has taken over much of the town.